The health benefits of horseradish root are many, but one advantage that seems to get overlooked is its great ability to help clear the lungs of tightness and congestion. It may not be the prettiest looking root vegetable as you can see from the picture but it is prepared into a potent sauce that is mainly used as a condiment worldwide. This vegetable is native to Europe and Asia and is related to the cabbage, broccoli and mustard plants amongst other cruciferous vegetables. It is a perennial plant and its leaves can grow over 1 meter in height but it is mainly cultivated for their roots that grow under the soil. It is known for its powerful and pungent qualities once prepared for consumption. In fact during the middle ages many Europeans would use horseradish to help with ailments such as coughs, colic, worms, tuberculosis and scurvy. The best part is if you decide to make your own horseradish sauce you can make it as hot or as mild as you wish. The most important benefit of this vegetable is that it is loaded with antioxidants. We all know that antioxidants are vital to help us detox the body, strengthen the immune system, fight infection and prevent disease such as cancer. Good source of vitamin C which contains antioxidants to keep us strong and fight infection and disease. Also helps the body absorb iron which is needed in the production of red blood cells and proper levels of oxygen intake. Vitamin C also helps with the production of collagen and elastin which helps keep us looking young. Keeps our bones and connective tissue healthy and helps prevent cataracts of the eye. They aid in the absorption of calcium and also help repair and rebuild bone, cartilage and connective tissue and help prevent osteoporosis. They protect us against the effects of radiation and pollution. Not only do they accomplish these tasks, but help disinfect the blood, resist bacteria, and stimulate bile secretion which helps liver function. Also helps with urinary tract infection because of its antibiotic properties, this may be because of its high sulfur content. Source of fiber which aids in digestion and helps prevent constipation. Offers smaller amounts of other vitamins and minerals such as potassium, sodium, iron, manganese, copper zinc and magnesium. Where to buy horseradish root? 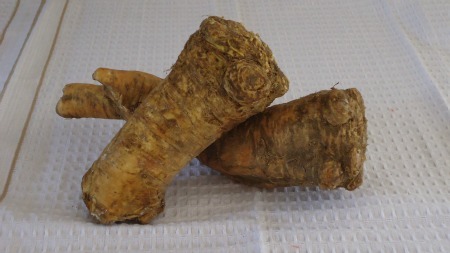 Many supermarkets sell horseradish in the produce section. Before purchasing make sure it isn’t soft or rubbery, because if it isn’t hard then it isn’t fresh. When in season your local farmers markets will usually have fresh horseradish available. I try to have a fresh batch of horseradish sauce handy in the fridge at all times so I can do my daily lung cleanse. ½ teaspoon of horseradish sauce with ½ teaspoon of liquid honey. You just eat the mixture as is and it feels really warm and helps your lungs expand and fill up with air and since I know that this veggie is high in antioxidants it feels advantageous to eat a little every day. Plus I love the sweetness of the honey. It is definitely a winning combination.